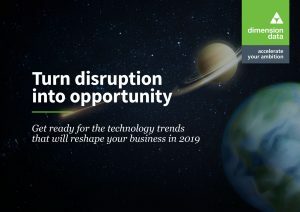 Dimension Data, the USD 8 billion global technology integrator and managed services provider, today launched its Tech Trends 2019 Report developed by its team of technology experts. It identifies fundamental industry trends that will come to define the business technology landscape in 2019 across customer experience, cybersecurity, digital business, digital infrastructure, digital workplace, technology futures, and services. In the report, Group CTO Ettienne Reinecke claims that 2019 will finally see digital transformation become a reality and predicts a spate of industry-wide disruption as innovative companies see long-term projects bear fruit.